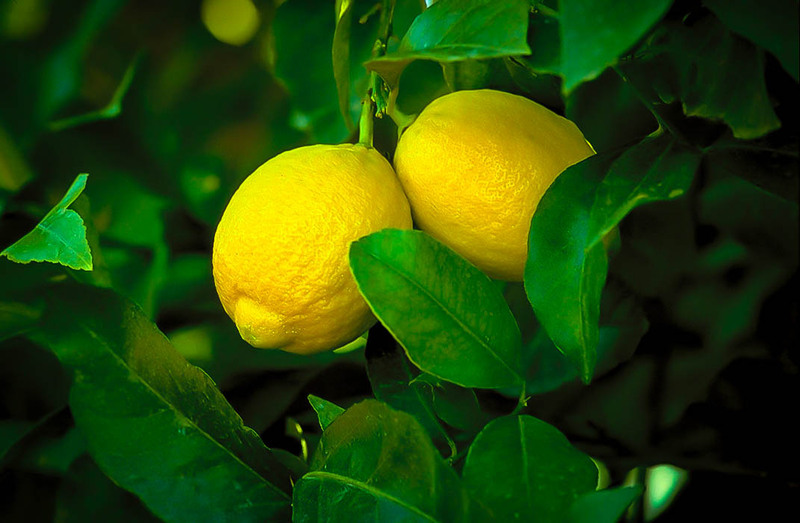 The Lisbon Lemon is a classic, heirloom lemon variety that has stood the test of time. 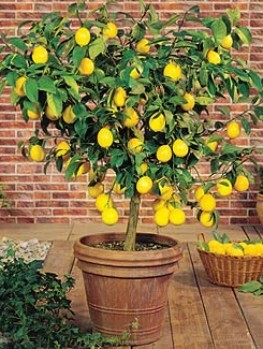 It is a vigorous, hardy tree that produces a heavy crop of beautiful lemons. The fruit is large, smooth-skinned, full of tangy juice, and with few seeds. The tree is evergreen, with beautiful, rich-green glossy leaves, and fragrant white flowers in spring, as well as in other seasons too. 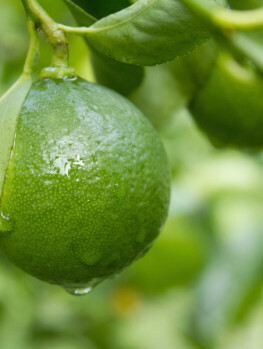 The main crop of fruit is during winter and spring, but some lemons will also be ripe at other seasons, as established trees can produce flowers at almost any time of year. This tree can be grown outdoors in frost-free areas, or indoors in winter in a large pot. Place your tree in a sunny place outdoors in warmer weather, for the best growth and fruit production. To grow your tree in a container, choose a large pot with drainage holes. Use a well-drained soil mix, and water thoroughly once the soil is 1/3rd dry. Fertilize during spring and summer. This tree is hardy, cold, heat and wind resistant, and it is not particularly prone to pests or diseases. It is always beautiful, and when you start harvesting your very own lemons, you will wonder why you waited so long to grow your own citrus fruit – it is a very easy thing to do, and the rewards are enormous. Of all the citrus fruits, lemons are undoubtedly the most versatile. From a slice in a drink to elaborate desserts, sorbets and pies, this fruit is used for both savory and sweet dishes, and can even be made into preserves and jams. So it makes sense to grow your own. We often only need one or two, and the great thing about the Lisbon Lemon is that besides its main fruiting season, it often has a few fruits at almost any other time of year – ready at hand just when you need them. 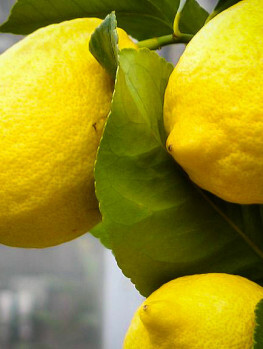 As a lemon, the fruit of the Lisbon Lemon stands out. It has a thick, smooth skin – great for zesting and for cutting a curling piece for a drink. It is extremely juicy, so you get plenty of juice from just one, and it has that true, tangy ‘lemon’ flavor that gives a real punch to everything it touches. It also has fewer seeds than most other kinds of lemons, so it is no wonder that this is the number one variety grown commercially in California, and loved by home growers around the world. 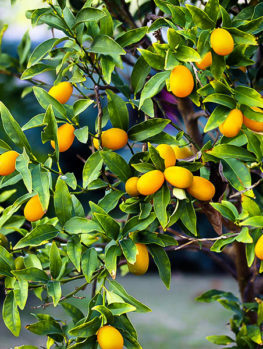 The Lisbon Lemon is an evergreen tree that when grown on a dwarfing root-stock, as ours are, develops into a small tree that in a container will be no more than 8 feet tall, and outdoors will probably reach around 12 feet tall. It has a rounded, bushy form, perhaps as wide as it is tall. When grown in a container, with a little pruning, it can be kept narrower to better fit into the space you have. In spring it produces white, fragrant flowers with a hint of purple on the back of the petals. The flowers don’t smell of lemon at all, but they do have a rich, floral perfume that is similar to the orange blossom. After flowering, you will see small green fruits developing, and you only need one tree for this – no need for a pollinator. The fruit will gradually develop and grow over summer and fall, and by winter the first fruits will yellow and ready to use. 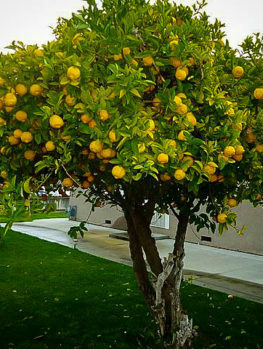 The Lisbon Lemon is a heavy-bearing tree, producing lots and lots of fruit, so through winter and spring you will be harvesting all the lemons you need. Established tree also produce flowers at other seasons, and these develop into a small crop that is scattered through the rest of the year – just what you need for a steady supply into the kitchen. 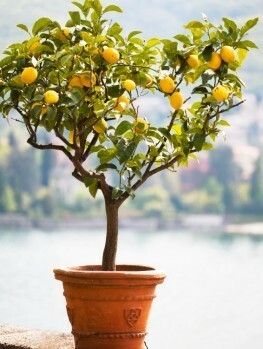 If you live in zones 9 or 10, you can plant your Lisbon Lemon in a sunny spot right in your garden. This variety has superior resistance to wind, very hot weather, and cold too, so it is an easy plant to grow anywhere where the winter lows dip a degree or two below freezing for short periods only. Plant in well-drained soil, and if you have poor drainage, plant your tree on a low mound. It is important to water at least weekly for the first two or three years, and these should be long, deep waterings. This will encourage deep rooting in your tree, so that it will become drought-resistant as it matures. In colder areas, you can grow your tree in a large pot – just make sure it has drainage holes, and use a compost for citrus. Alternatively, you can mix 2 parts regular potting soil with one part cactus soil to create a well-drained soil mix. Feed during spring and summer with a citrus fertilizer, or one for tomatoes, and let the soil become about 1/3 dry before watering again. Keep your tree outdoors when night temperatures are above 50 degrees, and keep it in a brightly-lit, cool space during the colder months. Fruit will continue to develop and ripen indoors in a bright spot. 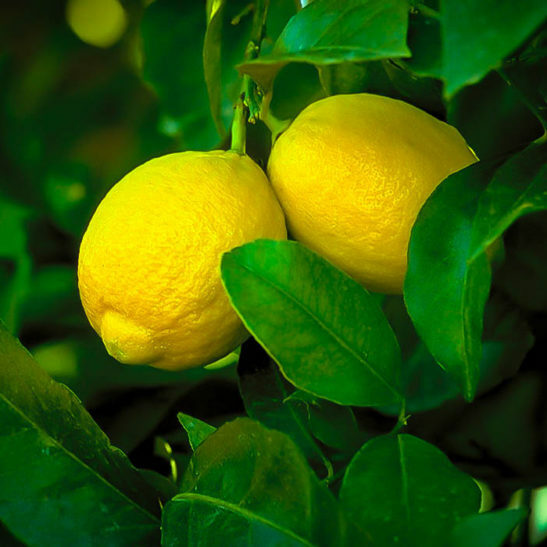 The Lisbon Lemon is an old variety of lemon believed to have originated in Portugal. It was first listed at the Nonatum Vale nursery, Boston, in 1843, and it was taken to California a few years later. It is still widely grown in that state for commercial crops, as well as being grown in Australia and North Africa. This heirloom variety is reliable and time-tested. Our trees are grown from stem pieces attached to a special citrus root that keeps the plant smaller than it would otherwise grow. 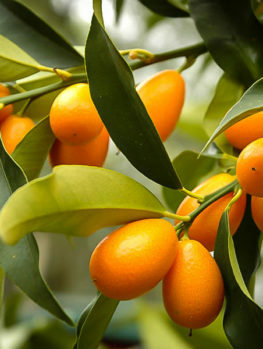 It is obvious that something as special as this variety cannot be grown from seed, so cheap seedling trees will be unreliable and take many, many years to even begin to have fruit. 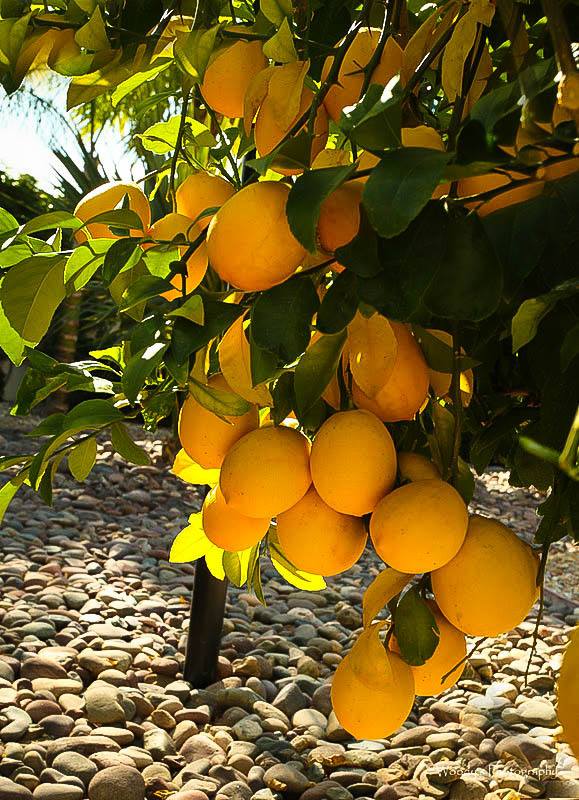 Our trees will give you the first harvest within a year or two of planting – so get ready for lemon treats.